Submit your work before September 17, 2018, and you will be participating in the most important global recognition of sport journalism. 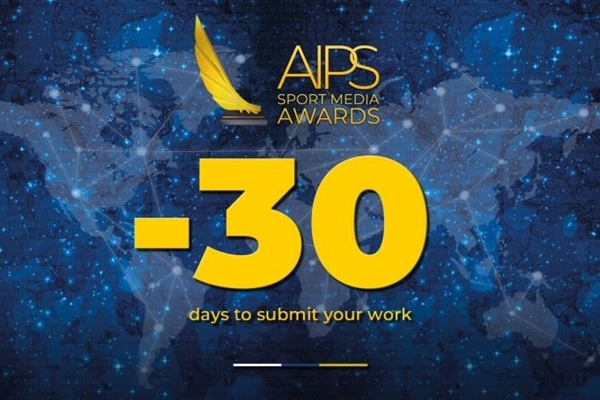 The clock is ticking and there is only one month to submit your work for the upcoming AIPS Sport Media Awards. Thirty days to send up to two submissions, thirty days to be participating in the most important accolade for sport journalism on an international scale. With a total of US$ 104,000 for all the finalists, including US$ 8,000 for each of the category winners, for works published or broadcast between July 1, 2017, and September 17, 2018. Writers, bloggers, commentators, photographers, producers... everyone is invited to participate. Thirty days, thirty quotes from the exclusive interviews that we have been doing to promote our hashtag, #SportMediaExcellence. Everything is available at www.aipsawards.com, where you can submit your work directly before September 17, 2018. 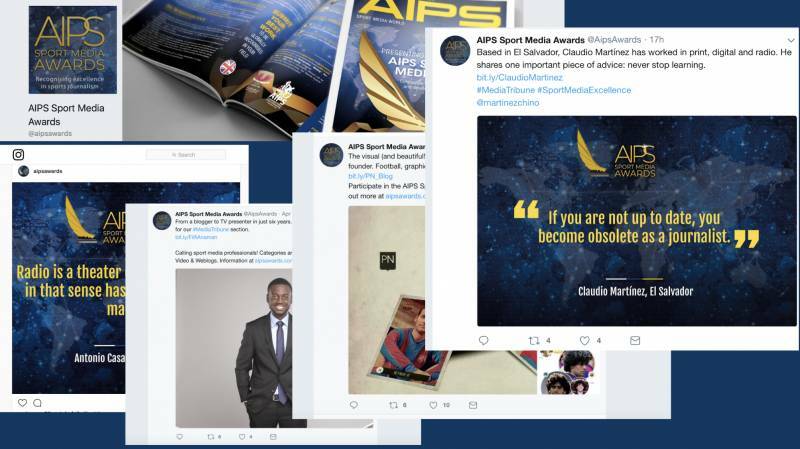 1) "The launch of the first edition of the AIPS Sport Media Awards has without a shadow of a doubt been the most valuable and important initiative this year. At these times of crisis, cultural investment in the future is absolutely fundamental. Quality journalism will always survive and even prosper, serving as a guarantee for the future. The creation of the AIPS Sport Media Awards is a step in that direction." AIPS Gianni Merlo, Italy. 2) "We don't often have the opportunity to participate in awards, let alone in a worldwide competition. Now I will have the task of reviewing my work and choosing two to apply. It will not be easy, but it is a good exercise." Carlos Vicente, from Prensa Libre, Guatemala. 3) "These awards are definitely a good innovation in our world: international recognition can be really helpful also in your own country, as you say: nemo propheta in patria." Peter Frei, Austria. 4) "It is a stimulus for the media professionals. And of course is the opportunity to check with other writers or broadcasters, what we are doing. By knowing new models and interpretations of the job, new generations can see and get to know mirrors or models for their work. Without those mirrors, it will be very difficult for them." Hernán Peláez, Colombia. 6) "It's great to have festival focused just on sport and sport storytelling. We need it to be a long-standing platform, because it will be a reunion, an opportunity to see what other people from different countries are doing, and also trigger some multiple sights about a subject or a character." Christian Rémoli, Argentina. 7) "I like that the AIPS Sport Media Awards exist, I like that this journalist association exists, because it is important to be together, to know how we think and exchange ideas to improve. And I think the most praiseworthy is that the prize comes from the hands of the same professionals who know you." Diego Arcos, Ecuador. 8) "We will all mobilise to help you in the promotion among journalists." Abdouaye Thiam, ANPS president, Senegal. 9) "Having the opportunity to be recognized worldwide is very important." Marcelo Olivera, Bolivia. 10) "These Awards will be useful for getting to know other projects, other styles, other concepts… and to allow all of us that love quality journalism to improve globally. It’s a pleasure that AIPS support the journalism with such an award." José David López, Spain. The Awards in figures: six main categories and more than 100,000 dollars in prizes. 11) "Rewarding people for the work they do is encouraging excellence and emulation. So it's an initiative which deserve to be saluted." Mamadou Koumé, Senegal. 12) "I think anything that puts the spotlight on young people or journalists and their work that they are doing is always a fantastic way to really encourage the next generation of journalists." Benny Bonsu, UK-Ghana. 13) "Here come the AIPS Sport Media Awards, raising the flags of sport media excellence. With the potential of inspiring a new generation and the power of identifying real examples of outstanding work that can act as a lighthouse for better journalism." Martin Mazur, Argentina. 14) "Winning this kind of Award requires to submit pieces that hold the attention, no matter the category. That means journalists will be forced to make good productions. This reward will push the next generation to work better." Carlos Kouande, Ivory Coast. 15) "It puts the stick high, for those who are just starting and the young people like me who are in this profession, reminds us what quality journalism is, how it is done, and more in this digital age. It invites us to leave our comfort zone. And it teaches how important creativity is, among all the ingredients of journalism." Fátima Martínez, Paraguay. 16) "A story that wins an award is a story that actually goes below the surface and digs in and actually tells a story that people cannot only relate to but that can make a difference in either their lives or the lives of other people. So if people take part in this award they would understand that it’s not just about writing a match report or just writing a news story.” Colin Udoh, Nigeria. 17) "I love the initiative. For many people, sports journalism is the less important branch of the profession, and that's partly because we have not worried ourselves in praising what we do and giving it the value it deserve. Today, sports journalism demands more human stories, go under the surface and find a real angle, beyond the result of a sports game, so it is good to have this kind of stimulus." Antonio Casale. 18) "To recognise the best sport journalists from around the world, those who pulled off some incredible feats in the art of sport storytelling, is a really fantastic initiative." Tega Onojaife, Nigeria. 19) "The AIPS Sport Media Awards can only elevate performances, which is what the industry needs to thrive. It is true that we work for a cause and not applause, but every human, at a point, needs a pat on the back. It’s only natural." Fifii Anaman, Ghana. 20) "In times where the urgent and instantaneous are predominant, sometimes leading to meaningless contents, we really value creativity and it is a pleasure that quality gets recognition." Sebastián Ruggiero, Argentina. 21) "The AIPS Sport Media Awards will help our colleagues understand that they need to produce quality content, knowing that there is someone, even if it is not their own media outlet, that is tracking this contents and ready to recognise the value of their work." Claudio Martínez, El Salvador. 22) "We have been underlining creativity for a long time. I will let all the contributors from The Blizzard know about this initiative". Jonathan Wilson, UK. 23) "I also appreciate the opening of the competition to all languages. There are Francophone, Anglophone, Hispanic, Arabic journalists and all should be rewarded on the basis of articles written in their national language. So this is a great initiative that we are looking forward to." Mamadou Koumé, Senegal. 24) "This is a great opportunity for my work to be seen by the most renowned journalists in the world, who will be the judges. In the newspaper, many of us postulate our work, not only in sports but in all branches of journalism, and we have won good prizes, so I'm sure I will apply." Lisandro Rengifo, Colombia. 25) "I was googling and found about the Awards and I thought it was very interesting. It is a great way for young people to position themselves". Javier Rodríguez, México. 26) "I'm thankful for getting an opportunity to express my gratitude and the invitation to participate in such a prestigious prize." Luis Soto, Peru. 27) "I'm very happy to be in. The fact that I write in Arabic was not a problem." Eslam Magdy, Egypt. 28) "Rather than being completely dependent on Internet giants, it is time to build a collaborative ecosystem for the European media that, in the interests of all, can join forces to provide powerful and well-functioning digital products.” David Böhm (Austria). 29) "It is a great idea, on top of having the chance of reading and viewing other works, and getting international recognition for what we do." Carlos González Lucay, Chile. 30) "And the winner is..." Imagine if it is you! Just sign up at www.aipsawards.com, submit your best work and we will take care from there. 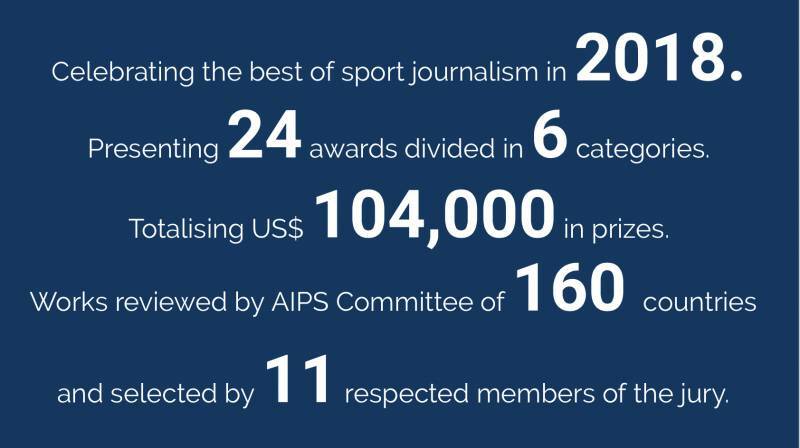 If you want to know 50 facts about the AIPS Sport Media Awards, please click here. Learn what qualifications you need to be eligible for participation. Awards given to each winner of each category. Chosen by the best judges. Sign up to participate and submit your work for evaluation.